Jury Duty and a Crash! Some of you may have noticed that it has been a couple of days since my last post. That is due to two things . . . first - jury duty. Second - a major computer crash! I was called to appear for jury duty this past Tuesday. I sat in the holding room with over 200 other people and watched an educational film about jury duty (rather nicely done with clips from famous movies involving juries!). Then the calling of names began. I wasn't in the first list. Whew! I wasn't in the second list. Yeah! The third list went by with no mention of my name. Then . . . the fourth list was called. I was the very first name called. Lucky me! Now, the jury selection for the trial my list of people were assigned to didn't start until Wednesday morning so we all left the building to reconvene the next day. I headed back to work since I was going to have to miss another day on Wednesday. Wednesday morning, the twenty of us called gathered and were questioned by the lawyers. I was positive I wouldn't be selected because none of the lawyers could figure out my last name. Why have that in your jury, right? Wrong! I was the first person selected to be on the jury. Then, the fun began. My jury of six was assigned to an assault case. We heard all of the evidence between being asked to leave the courtroom so the lawyers could argue without us hearing. That happened a LOT! Then we were asked to decide on a verdit. But, first, a "presiding juror" needed to be selected. This is what the "foreman of the jury" is now called, apparently. Anyway - take a wild shot in the dark about who was selected to be "presiding juror!" That is right! Me! My luck just keeps getting better! Anyway - we came up with a verdict in what seemed like 6 minutes but was actually a bit longer. Then we got to go in and out of the courtroom a few more times before being presented with sentencing information. Then it was back to the jury room to decide on a sentence. This took a bit longer because we wanted to make sure we knew all the facts presented to us for this phase of the process. The whole thing took all day. We did get a lunch break in the middle somewhere and we were dismissed at about 5:00 P.M. I then got in my car and drove to class which is from 6 until 10 P.M. It took me an hour and a half to get to school and find a parking spot (in east boofoo, by the way!). When I got into class I was a bit frazzled as you can well imagine. There will be no more mention of class for the time being on my blog. I am a bit upset with the whole situation and think it best to process more before saying something that I might regret. So - class was over and I headed home. I got home at about 10:45 to find Hubby upset. Apparently, our computer had crashed - big time - while I was at class. How fun is that? The crash does not let us get onto the computer to try to fix anything - joy, of joys! So - I am writing this blog from my podcasting computer upstairs. It doesn't have all the "bells and whistles" as the other computer nor does it have my picture files. All in all - it has been a stressful week! Here is to hoping that next week will run smoothly! Voice Update: Ush! My voice is showing the after effects of my stressful week by acting up. I have more breaks that a dropped box of pasta! Inhale exercises and massage seem to be destined to take much of my time this weekend. After I have a support group meeting. Yeah! Thankfully, I was able to get a lot of rest this weekend so I almost feel refreshed this morning! I am not sure that I will ever feel totally refreshed but . . . for now, I feel good! I am looking forward to another full week of work, class, and, joy of joys, jury duty on Tuesday! I can hardly wait!!! Speaking about class, I must admit that I am a bit apprehensive about the whole class thing. I "turned in" one assignment via the computer already and still have one more to complete prior to class on Wednesday. I have also read my two chapters and taken notes in my overly cautious style. So, why do I still feel like I won't be prepared for class?? I really think that this is the path I want to go down - the whole ASL interpreter thing - but . . . the teacher makes me wonder about myself. 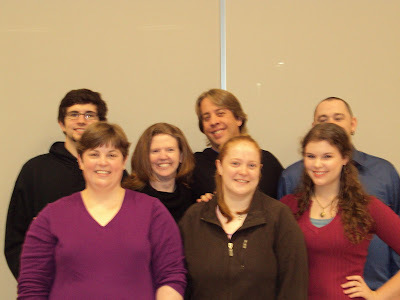 Speaking of ASL, this weekend I joined up with a group of friends (Hubby calls us "the gals") to take in Keith Wann. If you don't know him, he is a CODA performer. What is a CODA, you might ask? Excellent question! A CODA is a Child of Deaf Adults. That means that both of Keith's parents are deaf and he is hearing. Technically, a CODA can be deaf also but traditionally, CODAs are hearing children of deaf parents. Keith is a comedian who travels around and performs with the hopes of broadening understanding between the hearing and the Deaf worlds. He is funny, funny, funny. His humor is particularly funny to both people who are deaf (as shown by Beth's boyfriend, Zach, who is deaf and who was laughing the entire time!) and people who are involved in ASL such as interpreters, CODAs, and people who know deaf people. You can check out some of his videos on uTube, I do believe. He gives hilarious insight into living with Deaf parents. Despite the fact that I had to travel about an hour to get to the show, it was well worth it. The ride home was interesting too since I saw an accident where a car ended up on its roof with the driver side window in the next lane of traffic. Everyone was okay - which is what made the accident interesting and not tragic! This is our group posing with Keith. Keith is in the center back. Mark is the guy hiding behind Beth's head for some reason. 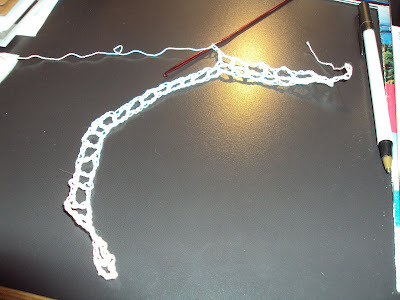 The other thing I have been doing this past weekend is crocheting. Once again I had to take a number of rows out to redo them but, I feel like I am making progress! I am finished with 20 out of 27 rows! Yeah! Voice Update: Doing well, doing well. My work week is over for another week! Yeah! Now I get to concentrate on my homework and maybe even catching up on some sleep! Last night after getting home from work and enjoying a lovely meal prepared by my very thoughtful Hubby, I actually was very productive. I called LA - a woman (not the city!) who is taking my place in Destination Imagination this year as the Instant Challenge Challenge Master. We arranged for me to drop off all of the materials which have been crowding my guest room closet for the past billion years at her office. I suddenly feel just a little bit lighter! Also I finally sent an invitation to all of my SD support group members for the meeting next Saturday. Late notice, I know but . . . I am working on it! Catching up on email was another project which I got finished. I feel so good about myself! Of course, now I only have to get started on my homework for class . . .
On a different topic. We have a new addition to our house . 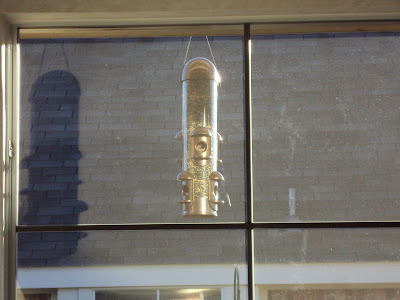 . .
We finally got another bird feeder! Our old feeder broke when Hubby accidentally dropped it. 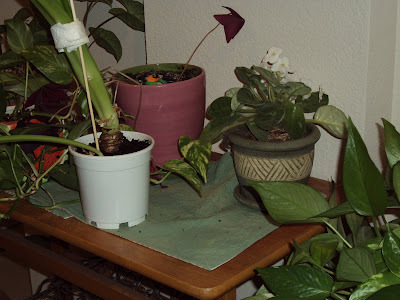 The plastic had gotten very fragile from our Texas heat and then the cold snap we experienced recently. Without the bird feeder, our "cat entertainment center" had been out of commission. This left Skor with WAY too much free time to get into other kinds of trouble! Now that the new feeder is up, Skor can resume his former hobby of birdwatching! This is a picture of him this morning. Today I plan on taking a nap. After I get home from the DAC and from dropping all of the DI stuff off with LA. Doesn't that sound like Nirvana? Lastly (I don't like this word and always wonder why people use it but I felt that my use of finally in this post had already reached the limits of usage so . 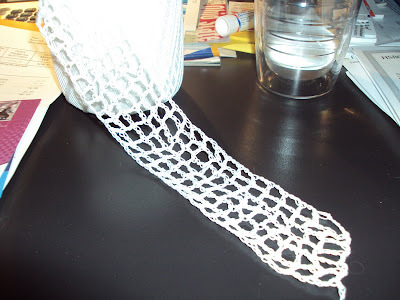 . .), here is a picture of my crocheting project! I am on row 14 of 27! I know - it is taking me a while but . . . slow and steady wins the race, right? My mother is still working on hers and my Aunt Donna (my mother's sister) has already finished, yes, FINISHED, her hot pad. What a showoff! Voice Update: Doing very well. I forgot to do my exercises yesterday in my frenzy of catching up on stuff. That isn't good. Luckily, my voice is still doing well. Now to get into my routine of exercises! Well, I survived the first of many days I will call "suicide schedules!" I had work and then class from 6 until 10 P.M. That is a LONG day! Especially when you add in the 40-45 minute drive home. Anyway, I survived. It was nice to see so many of my ASL friends in class. The class itself seems like it is going to be interesting but I am going to reserve my final judgement until we really get into things! Work yesterday was good. Well, it was better than Tuesday since I had a bit more of an idea about what was going on. I also had a speech appointment so I got to chat a bit with Susan while she was working on my throat. Surprisingly, despite everything that has been going on in my life lately (illness and class, etc.) my voice got a seal of approval. In fact, Susan said she was very impressed with how well it is doing. She said that while my neck was a bit "crunchy" it wasn't as tight as she had predicted it to be after hearing that I had been sick. YEAH! I must be doing something right! One thing I am not doing well at is the whole support group thing. We are supposed to have a meeting in two weeks and I haven't even sent out the notice! I did secure a location but . . . probably no one will show up! Of well! I have good intentions! We will see what happens with that. Okay - I am going to make this a bit shorter than I could. Have a good Day! Voice Update: I pretty much said it all in the main body of the post. Doing well. Doing well! Okay, now that I have that out of the way. I didn't post yesterday because I was so darn tired when I woke up that I just HAD to have a nap before heading to work and that meant cutting out blogging. Sorry! I am feeling better but not 100% yet. It seems to be very important for me to watch what I eat very carefully. If I eat too much too fast or something which is too "rich" my stomach lets me know (loudly!) that it doesn't approve! Yesterday I ate toast for breakfast. Toast for lunch. And chicken and cheese quesedillas (homemade) for dinner. Dinner was WAY too much for my stomach and I only ate half of what I would normally eat. Maybe this is going to be a new way of life for me!?! Water is another issue I am having since my illness. I know that I need to drink liquids to stave off the possibility of dehydration but . . . I just can't seem to do it. Water isn't tasting good to me. Frankly, nothing is tasting too good to me at this moment! Another problem with water is that it fills my stomach up and then my stomach hurts. Drats! Currently I am taking small sips multiple times a day to try to get my quota of liquids. Today I finally got out to walk. I didn't complete my entire route but I did get out there. It was a lovely, damp day with pastel pink and blue skies. After walking my abbreviated route which took about 20 minutes I did some Wii Fit - again much abbreviated. I must admit that my stomach didn't enjoy either of these two activities but fooey on my stomach! In other news . . . I am working all this week. And all next week. And all every week until the bosses find a permanent person. Linda decided over the weekend to quit to spend time with her family. She is in a rather negative place since she was told that she will continue chemo for the rest of her life. She is naturally assuming that the "rest of her life" won't be very long. I keep reminding her that through God all things are possible. So sad. Please continue praying for her. The new office is very nice for working in. It is well lit and I am getting it pretty well organized for efficiency. Yesterday was a bit stressful because the phone system wasn't working quite right so the phone person was at the office for over an hour. Also I still had several bins of material to unpack from the weekend. Hopefully today will be a bit calmer. I do have a speech appointment today with Susan so that will be a nice break in my work day. My next class, Interpreting One, starts this evening. From six until ten - at night! Add a 45 minute drive home onto the end of that and . . .well, I might get to see my darling Hubby snoozing when I get home! 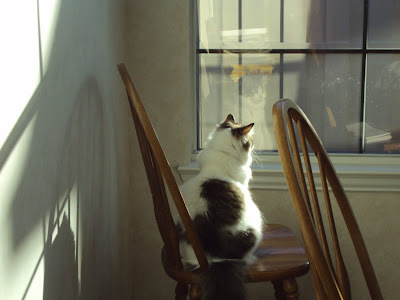 I can only imagine how the kitties - especially Skor - will take my prolonged absence! It will be interesting, to say the least! Wish me luck! Voice Update: Doing well. I haven't gotten back on track with my exercises yet but I did a few yesterday. Being sick really derails everything, doesn't it? Do you know the old saying "be careful what you wish for?" Well, I was wishing for the weekend, right? As it turned out, I probably should have just wished that the week kept going as it was going! Friday night I got home from work, met Hubby at the bank, got home and had dinner. Then I went to bed really, really early. I was SOOOOO tired! I slept in a bit on Saturday and woke up feeling pretty darn good. I did laundry and crocheted (I now have ten rows of the needed 27 completed! ), read a book by Mary Higgins Clark. Basically, I had a good time. 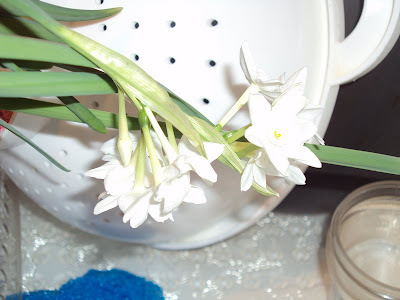 In the late afternoon I decided to take a nap - this was after Hubby noticed that I had over watered all of our plants and that they were leaking gross water all over the carpets which the two of us spent about half an hour cleaning up. By the time I got up it was time to head to Wal Mart for a much needed trip. We were running out of toilet paper and zip lock bags! Before heading to "Wally World," we ate dinner at What-A-Burger. This is one of our favorite places to have a dinner out. They make good burgers! As soon as I was finished eating I noticed that my stomach was a bit . . . unsettled. It wasn't anything serious though so we headed to "Wally World" and finished our trip. All during the shopping I was feeling a bit "off" but couldn't quite put my finger on what was wrong. Once we were home I had to zip into the bathroom. And THAT started it all. I pretty much spent the rest of the evening in the bathroom. Diarrhea and then . . . after much waiting and pacing . . . the "chance" to - shall we say - review everything I had eaten for dinner. What fun! This lovely duo continued approximately every two hours for the rest of the evening and through the next morning. I was so thirsty but even water was immediately rejected from my system! I resorted to just swishing water around in my mouth and then spitting it out. Can you say - pathetic? The vomiting ended early Sunday morning - around 6:00 A.M. I think. However, the trips to the bathroom continued though they did slow their pace dramatically. I was able to keep a few sips of orange juice down by around noon along with a half of an individual cup of applesauce and I actually showered and took a walk up and down the block by about 4:00 P.M. Dinner was chicken noodle soup - it was yummy!- and then it was some tv and bed. After sleeping through the night (well, with one bathroom trip) I got up this morning to my stomach making very strong demands for something to eat. I finished the cup of applesauce and headed back to bed for about an hour before the cats decided that I needed to get up. Then I warmed up left-over soup and had a nice breakfast. I didn't get up to go walking this morning nor did I do my Wii. My mind isn't too happy about this but my body just wasn't going to be able to handle it today. I am supposed to head to work today but I am thinking that might not be a good idea. Linda will be there and with her lowered immune system . . . I don't think that this "bug" that I had/have would be good exposure for her. Besides, I am continuing to experience some diarrhea. Maybe I will just go back to sleep for a while. Voice Update: The whole "reviewing of previously eaten meals" was rather rough on my voice. I also didn't do my exercises while making the trips to the bathroom. In hindsight, it might have been the perfect time to do my exercises. I mean - what else was I really doing other than waiting around? Anyway - my voice is okay - could be better but is still hanging in there. Well. This week has really been a "piece of work." I have been packing and working and crocheting and Wii-ing and feeling exhausted. Yesterday I said the week seemed like it would never end and, guess what! It won't! Yesterday I got home from work at 7:00 with the knowledge that I "get" to get back THIS afternoon! To unpack. Doesn't that sound like "fun?" Well, I am going to try to block that from my mind until I get there. I managed to get my tired hide outside this morning in the lovely weather - 49 degrees - and walk. It was beautiful. A bit damp from the rain we got last night but beautiful. I didn't realize how much I have missed walking each morning until I started again. When I got home (sweating) I headed straight to the Wii where I proceeded to get even sweatier (if that was possible!). I did my Yoga and my strength training and one balance game. Eventually I hope to re-introduce the short weight lifting routine I used to do. However, one small baby step at a time, right? Speaking of baby steps. . . look at this picture and try to see if you can find what is "wrong." Have you figured it out? Yes! This "grid" is MUCH smaller than it was the last time I showed it to you. Why? Just to add to my week . . . I realized yesterday that I had made a major mistake in the grid - in the second row - and so I took everything out to redo it. Like it isn't taking me long enough to do this project in the first place! Mom is already working on "part two" of her project! She might be done before I even get this darn grid finished! I had planned to have a quiet day today. I want to go to the DAC since I haven't been there for a couple weeks and then I was going to come home, take a nap, wake up and work on my crochet. Not happening. I can hardly wait until next week - the fun of unpacking what I don't get done today PLUS a class on Wednesday night from 6 to 10!!! Please keep praying for Linda. She needs strength and hope right now. Voice Update: Doing really well despite the fact that I almost choked to death yesterday on some orange juice! My SD makes swallowing tricky and there are times when some liquid or another "goes down the wrong way" and I choke. This is NOT fun and I end up coughing and red-faced and teary eyed before the experience is resolved. This is one reason many people with SD find it easier to drink all liquids through a straw - to minimize choking. The choking is NOT fun and seems to always happen at the worst time (I can even choke on my own spit!) like yesterday when I was in the middle of talking to a client at work! This week just seems to be expanding and growing longer and longer. Even though today is my last work day of the week it just seems like it will never end! Yesterday was stressful for me at work. It started out slow and then . . . can you say avalanche? By the end of the day I wasn't sure if I was coming or going and things just seemed to get out of control! Luckily, there isn't anything which is VITAL just stuff that the bosses want done ASAP. Today I "get" to go back and try to figure out what I still need to do. Plus, I get to make signs for the office to tell patients that we have moved and for the neighboring offices to "apologize for the moving noise on Friday." Fun, fun. Then I got some bad news about Linda. Apparently, she has been told that she will be on chemo for the rest of her life. She isn't sure about the strength of the chemo but she is really, really bummed. I can't say that I blame her at all. Please keep Linda in your prayers. 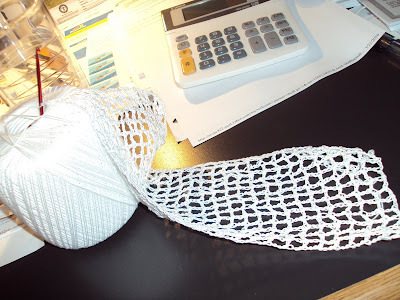 This is where I should show you a picture of my crocheting project. However, I didn't do any work on it last night so there is nothing new to show! I was so tired when I got home that I just couldn't imagine working on my crochet - even though I enjoy it! My eyes were/are tired because the lighting in the office isn't too good now that they removed the upper cabinets which had lights under them. Anyway . . . I hope you all have a super day! Voice Update: Still holding my own. Susan was even happy with how things are sounding. We talked a bit about cutting down my sessions and decided to wait until after I stop working to see how things go after I am not using my voice as much as I have been. Half Over and Yet Just Beginning! Happy Wednesday! That means that the week is half over, right? If only it was the simple at work! This, you see, is the week the office is FINALLY moving! That means that everything has to be ready to move - by Friday! If you have ever watched an episode of the show "Hoarders" you have an idea about my working world lately! In my office they have removed all of the cabinets and installed them in the new office. That means that everything in those cabinets -half of which I use daily - had to be packed. The stuff I use all the time is now in plastic tubs. Some stuff I used is packed up in larger tubs waiting to be moved so I just don't use it! And then there are the patient files. Boxes and boxes and boxes of patient files. Patients who are not currently seeing the therapists but whose records they are required to keep for at least five years. Let me tell you, these four women see a LOT of clients! I have been assigned the task of going through this multitude of boxes to cull out the client folders older than five years. Such fun! One therapist had her files labeled with the year of their last appointment - that made it easy to cull. The others . . . let's just say that the files are labeled NOW! Plus, once all of the boxes and tubs and things are actually moved into the office, take a wild guess who they need/want to unpack everything for the office! Yep - me! So, basically, even if I am finished packing (which I am not), I am really only half done with the task. Talk about making the week seem longer! In other news -here is my daily crochet update. Yesterday and this morning I have had a very "special" helper with my project. I'll bet that you can guess who it is! Yep. Skor. "Hmmmm. I have watched Mommy do this for a while. I am pretty sure I can do it. First you grab this stick thing." "Next you twist it. I think this is the way. Wait - there is something you need to do with that thread stuff. Too bad Mommy won't let me near it. 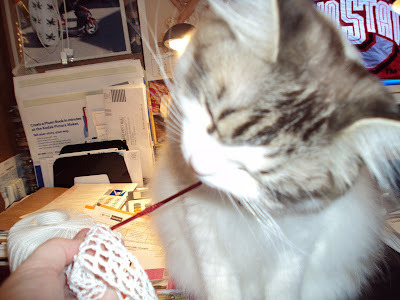 Last night I helped Mommy by cutting that thread into pieces while she was working. I still don't understand why she knotted it back together!" 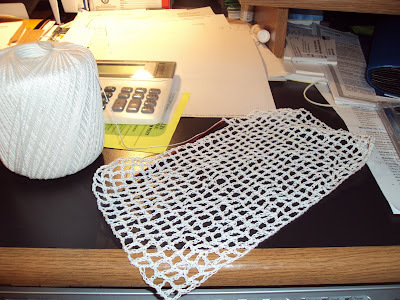 So far I have seven of the needed twenty seven rows of my grid completed. I am getting better at the whole crochet thing though and almost have how to hold the thread figured out. Now it is just a matter of time! Voice Update: Doing well. I have been doing inhale a lot - singing to the radio (which is very tough to do!). Plus I did do my massage yesterday - not as long as I should have but . . . tiny steps! Well, the "blahs" are receding. They were helped on their way by the following sight while on my way to lunch with my friends. In fact, I did a u-turn (legal of course) and headed back to take some pictures. 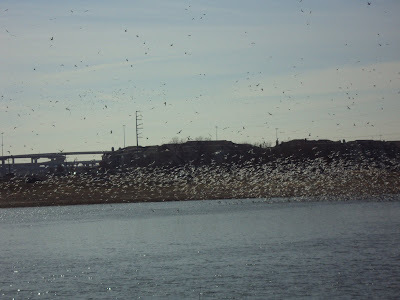 There were HUNDREDS of gulls on this pond. It is a bit difficult to see in the pictures because I wasn't going to walk all the way around the pond (which is pretty big) in the cold (36 or so) to get a better shot. There were also some vultures/buzzards on the wing - HUGE wingspans! 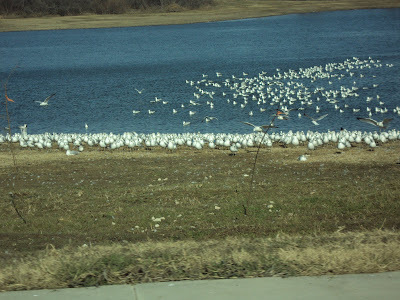 The gulls all congregated on one side of the pond - near the road. I actually was in my car when I took this shot with my hazard lights on stopped at the side of the road. Luckily no one passed me while I took my shot! 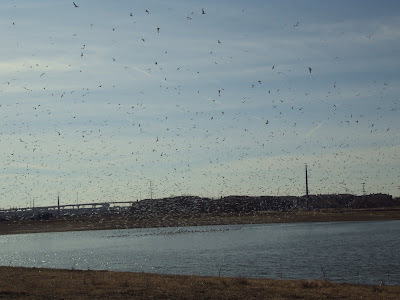 Another shot of the birds in flight. The sheer number was amazing. Of course, I should mention that this pond is next to a landfill . . .
Once I got to Starbucks to meet my friends I was in a bit of a better mood. 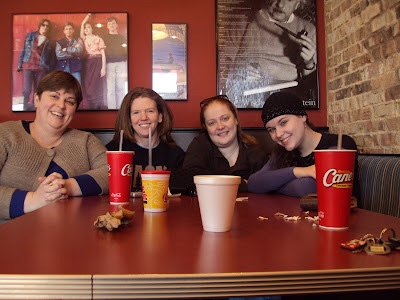 Then we headed across the street to Cane's for lunch. 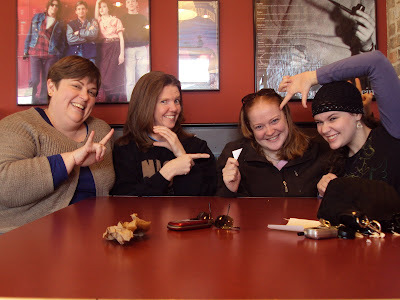 This is my friend, Beth's, favorite restaurant (she is in the black hat in the photos). We had a nice time eating and talking and catching up. Then we got a bit crazy with the photos! This one was pretty nice. I look a bit loopy because I was the one doing the timer on the camera and then sitting down before it took the picture! Of course we had to take a "silly" one too! We have such fun when we get together! They are such great friends! They certainly helped to chase the "blahs" away! After lunch I headed to Jo Ann's Fabrics hoping to pick up some bright, multi-colored thread for my hot pad project. They didn't have any! I was disappointed. I guess I might have to venture into Internet ordering IF I finish this hot pad and decide to embark on creating another. Speaking of hot pads . . . I actually started crocheting yesterday. Hubby had to work late so I checked out Internet videos to get started. This is how far I got. 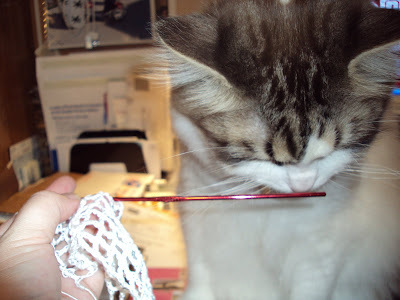 I have to think that starting to crochet with a TINY hook and THIN thread might not be the best way to start! 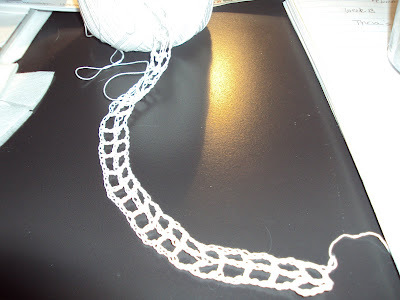 I was working on the chain that is the one side of the grid for almost all afternoon before I got it to the point where it was good enough to move on to starting the grid! Now I have to make the grid into a square . . . that might take me a while! I will show you a picture each post to keep you informed. Aren't you excited? Voice Update: I freaked Hubby out when he got home by talking to him on the inhale. I needed to do some more inhale and wanted to talk to him at the same time so . . . it was convenient! I also did more massage yesterday - while watching TV and being frustrated with crocheting! My voice is pretty darn good at the moment! We will see how it is after a day at work! 1.tearfully or weakly emotional; foolishly sentimental: a maudlin story of a little orphan and her lost dog. 2.foolishly or mawkishly sentimental because of drunkenness. First of all - I am not drunk so . . . I am just tearfully or weakly emotional! For some reason I am just feeling rather "blah" today and I thought maudlin best covered my bases. Over the weekend I was battling off a head cold - which is pretty much tamed at the moment . That left me feeling blah. Then I got one of the books for class in the mail - a book which was used in "intro" (which I haven't taken yet). I realized that I am a bit behind in that - the rest of the class will be ahead of me in that book so . . . I worked my way through some of what I need to make up. Being behind in a class which hasn't even started makes me feel "blah." I finished a knitting project I was working on (I have no idea when I actually started it but it has been sitting in the closet half finished for some time now!) so that I can focus on the crocheting project that my mom and I are supposedly doing together. Mom is already working away on her project and I haven't even started. That makes me feel "blah." This week will be one in which I "get" to work every day. That makes me feel a bit "blah." There is a bright spot in all this "blah" though. Today I will not be working because I am meeting my friends from ASL for lunch. I am excited about seeing everyone again. True, classes start next week but Beth won't be joining us because she will be focusing on her classes at DBU. Hopefully the lunch will cure me of the "blahs" and change maudlin Monday into Magnificent Monday! Voice Update: I have been vigilant about my inhalation exercises so everything is pretty good. I do need to step up my massage though. It never seems like I have enough time during the day to do massage the way I want! Sorry about not posting yesterday but I was sleeping off a cold which hit me on Friday and is still sort of lingering around today. However, everything is getting better (keep your fingers crossed!). The temps are still a bit "brisk" in my neck of the woods so there is nothing better than staying inside cuddled up with a good book. Here are the latest I have read. Because I have so many today I am only going to go in depth on some. 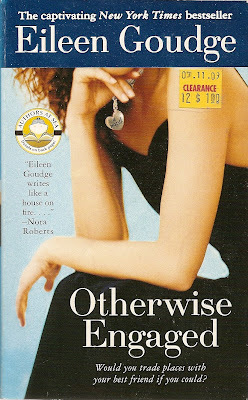 First - Otherwise Engaged by Eileen Goudge. In this fun novel, two high school friends hatch a plan to help Jessie get a magazine article. Erin, her friend, is married and lives in their hometown while Jessie is single and lives in New York - exactly the opposite of what they both thought would happen when they were young. Now, for the article, Jessie and Erin are changing places to see what their lives might have been like if they had followed through on their original plans. This book is a fun read and following along on the journeys the two friends take to discovering themselves also makes you stop and take stock of your life as well. Betrayal in Death by J.D. Robb is up next. Another futuristic murder mystery story by the master. As always, J.D. 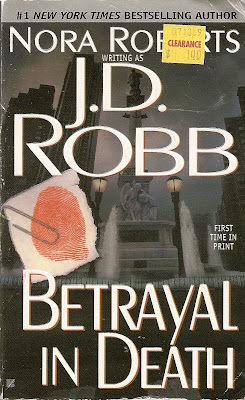 Robb is a wise choice for an entertaining read. 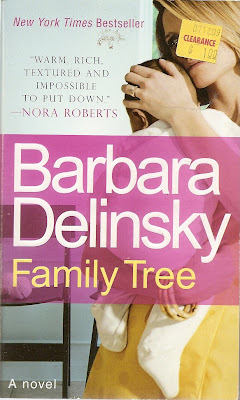 Family Tree by Barbara Delinsky. This is a powerful book which gets you thinking about things you thought you knew about your own family. In this book a young couple is having their first child. Everything is fine until the adorable little girl is born. You see, she looks . . . different. She looks like she is African American while both parents are definitely not. This tiny baby girl leads the parents - and their family - on a long, rough road of family trees, suspicion, hurt feelings, and hidden secrets. While reading this book isn't always comfortable, it does make you think. 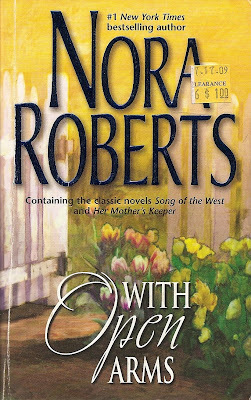 With Open Arms by Nora Roberts contains two short novels: Song of the West and Her Mother's Keeper. Nora Roberts is always a good, light read and these two stories are no exception. Side Effects by Michale Palmer. This oldie but goodie is from my grandmother's stash. I was a bit hesitant to start it since some of the books from her stash are a bit beyond my taste. However, I was pleasantly surprised by this book. Kate Bennett, a well respected pathologist at the hospital on the verge of being named department head, finds herself embroiled in the mystery of several suspicious deaths. As she investigates she finds that not only is her career involved but also her marriage and possibly her own life too. I enjoyed this book a lot. It is well written and the plot is something which could happen today and which is just a bit chilling. 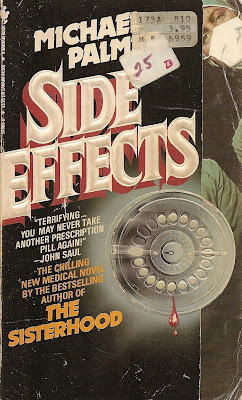 James Patterson's Against Medical Advice written with Hal Friedman is next. 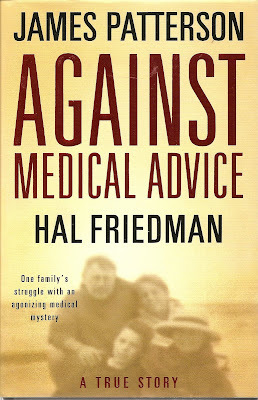 This book is the real story of Hal Friedman's son, Corey, and his struggle with devastating medical problems. This book could be a bit much to read since it does tell, sometimes graphically, about medical issues (no blood and gore though) but it is also very inspiring and full of hope. 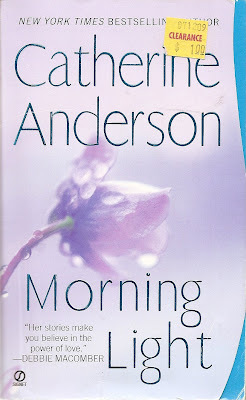 Morning Light by Catherine Anderson is the next book. Anderson writes a good story of a woman, Loni, who is "blessed" with second sight and a rancher, Clint, who doesn't quite believe in such things. The two are thrown together when Loni moves to Clint's small town trying to hide from notoriety after helping police in a kidnapping case. However, she starts seeing Clint's son in danger and is compelled to tell Clint so he can save the boy. The only problem? Clint doesn't have a son. Or does he? While dealing with a "mystical" theme, Catherine Anderson does a nice job of keeping it light and believable. The writing is rich and the story catches you up in the feelings of the characters. A good read. Bed of Roses by Nora Roberts is the next book I read but, I don't have a picture of it because I gave the book to my mother to read. This is the second in the Brides series by Roberts and is refreshing to read as it doesn't quite follow the traditional Roberts recipe. It left me wanting to read the third book - not yet published! 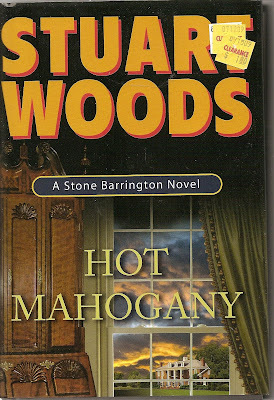 Stuart Woods, a favorite of my favorite Aunt Donna, is up next with Hot Mahogany. This is a good, light mystery with Stone Barrington as the main character. 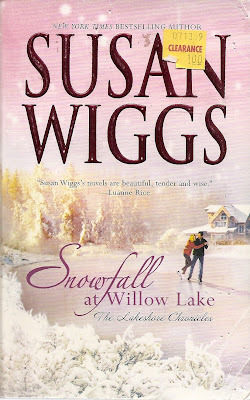 Snowfall at Willow Lake by Susan Wiggs. Beginning with a party which doesn't quite feel "right," this book thrusts you into the life of Sophie Bellamy, an international lawyer, who has scarified a lot to do her job. After the party, Sophie stops to reexamine her choices and decides to make some major changes. Those changes take her to the little village of Avalon where she begins to adjust to her new life. I found this book very compelling. One of those that you don't want to put down until you reach the conclusion. 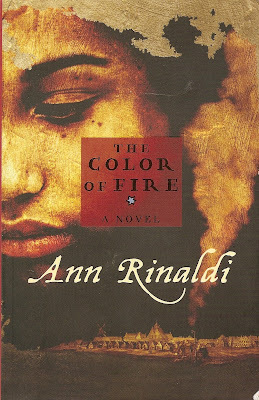 Ann Rinaldi, my favorite author of young adult historical fiction, shows up this time with The Color of Fire. Phoebe, a slave in 1740's New York, guides readers through a time of racial and religious tensions. This is a wonderful book for taking a peek into a world which is part of our history but one which we might not understand. 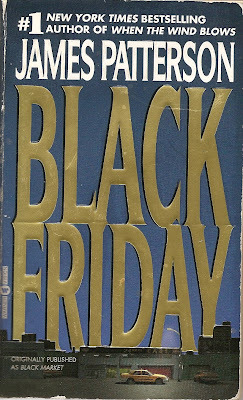 Another James Patterson book , Black Friday is on my list. The U.S. financial world is thrown into chaos after a mysterious group destroys much of Wall Street. With no apparent demands or reason for the destruction, the group leaves those investigating in the dark as they struggle to piece together the answer before the world's financial market is affected. This is a powerful book with I enjoyed a lot. I found myself trying to piece together the puzzle along with the characters and when the answer is finally revealed just as amazed as they were. 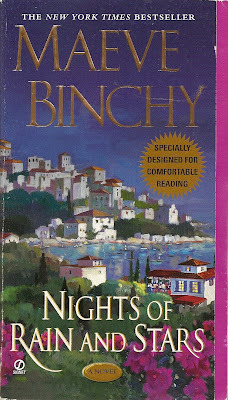 Nights of Rain and Stars by Maeve Binchy is next. Taking place in a small Greece town, this novel lets us follow a group of strangers who are brought together by a local tragedy. 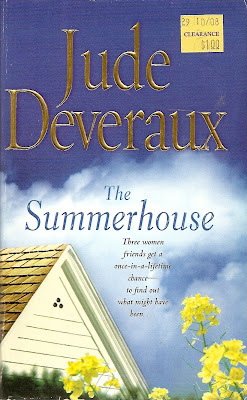 Jude Deveraux contributes the next book, The Summerhouse. Three woman who met at a turning point in all of their lives gather together again and find themselves on an interesting, and intriguing journey. This book is a great read with an odd little twist in it which leaves the reader wondering . . . Body of Evidence by Patricia Cornwell is a book I read before but read again and enjoyed as much the second time as the first. 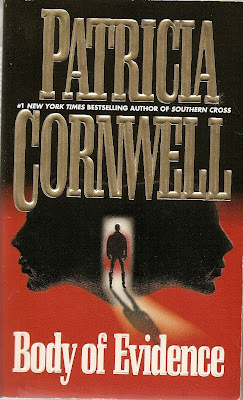 All of Cornwell's books are well written and masterful! Wrapping up this book bonanza is a book I picked up on a whim at Wal Mart. I am a fan of Christmas fiction and this looked like a good one. 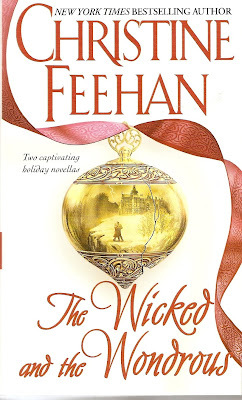 I wasn't quite prepared for what I got in The Wicked and the Wondrous by Christine Feehan. This book contains two tales centered around Christmas, "The Twilight Before Christmas" and "After the Music." Both tales are romantic as well as full of the unknown. In each of the stories, there is witchcraft in some form and in each is the story of love which must conquer evil to find peace. Well, that is it! I will have to make an effort to post about my books more frequently so that I don't end up with such a HUGE pile to post about! Thanks for hanging in there and have a super weekend! Voice Update: Doing well but it is sort of hard to tell since I have been basically sleeping non-stop for two days! Well, Good Morning to Me! You know that you should just climb back under the covers when your day starts like this. First, I checked out the temperature . 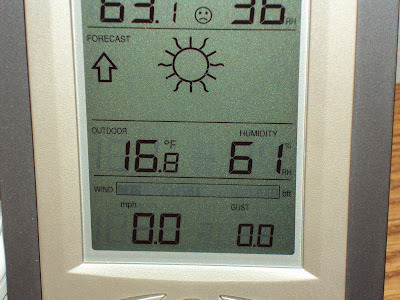 . .
16.8 is REALLY cold for Texas! AND this is about an entire degree colder than it was when Hubby woke up so the temps are going down! 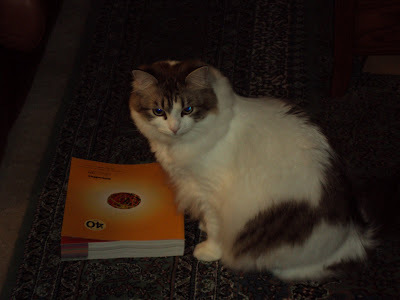 Then I walked out to the living room and saw . . . .
Hmmmm. This isn't looking too good. From the location I can tell that one of my plants took a header. Also notice the empty space in the corner of the wine rack turned plant stand. See the empty corner? 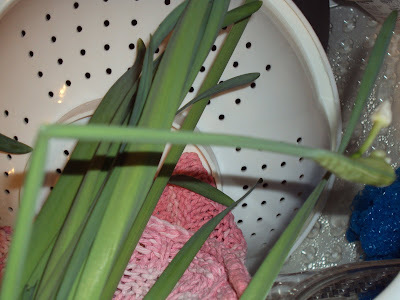 That is where my Paper Whites were sitting when I went to bed last night. Where are they now? Well - here is a clue. A shot of a broken stem with a bud which was just starting to open in front of some stuff . . .
Another hint - some open blooms in front of something . . . 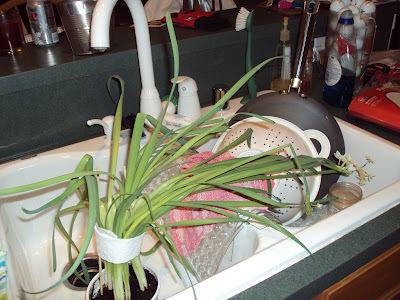 Yes, my Paper Whites are in the sink! Hubby picked them up and put them there to recover from their terrible fall (where are the King's horses and the King's men?). 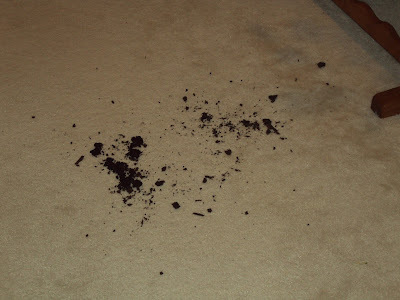 Of course, Hubby left the mess for me to clean up. Isn't he great? 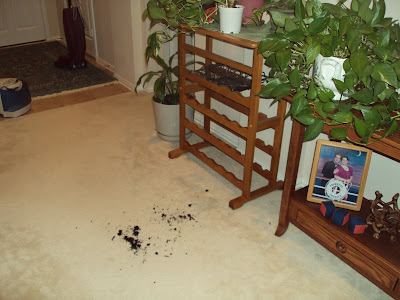 It was me and the evil vacuum cleaner swooping in to save the recently steam-cleaned carpet! Who was the culprit in this little "incident" you ask? I think I hear those covers calling my name! P.S. I did Wii this morning - five days in a row!!! YEAH! Ten days in a row, here I come! Voice Update: Ouch! My neck hurts where Susan was working on it - still! Oh well!My voice is doing well. The Best Post Ever . . . .
On the walk from my water cooler to the computer room this morning I had THE idea. The idea for the BEST blog post ever, It was something which would catch your attention, make you think, leave an impression on you which would last the entire day. The post was pre-formed in my mind. It was perfect. I sat at the keyboard and it was lost. Try as I might, I can not recapture the idea for the best post ever. Like mist on a sunny day, it is gone too soon to be captured. *sigh* Oh well. I guess you will just have to settle for an ordinary post from me again today. I apologize! Yesterday I spent about four hours at work cleaning and packing. My job for the day was cleaning and packing the "kitchen" area. This is a small area with three little cupboards around the sink area. Let me tell you - for a group of women, this area was a MESS! Food was in the cupboards which was five years out of date. There was gunk under the sink which is best not described. Luckily, packing everything up (and throwing a LOT of old stuff away) didn't take me that long AND - with the exception of the coffee pot and some miscellaneous cups and stuff - it is done! Now I can move on to some files which need to be cleaned out and shredded. Doesn't that sound like fun to you? My speech appointment went very well yesterday. Susan said that my throat was the loosest it has been for a while and that my voice was "excellent." I didn't have any breaks at all while I was speaking to her in my session. Of course, when my session was done I was out talking to my other bosses and heard some breaks. Could be they stress me out talking about packing, etc. What do you think? In other news, my mother will be proud of me. I stopped at several different stores yesterday (she says I never get out and shop). On my way to work I hit the post office (stamps for three of the bosses), Staples (tubs to pack for the move), Wal Mart (thread and a crochet hook for a project Mom and I are doing "together" even though I have no clue how to crochet! ), and the gas station (which helped me actually get to work!). Then, on the way home I stopped at Big Lots to pick up some Christmas bows (at half price) for my Christmas wreath. The old bows had seen better days so . . . I needed news ones. While getting bows I found some fake candle lights for in the windows (we used to do this at home and I have always liked the look), some treats for my Dad (in a couple years - they have to get nice and stale), some sweatshirts I can make into cardigans (good cardigans are always a good idea), some Healthy Choice meals (at an exceptional price) and some cream of chicken soup. That was quite a shopping spree for me! This morning I woke up with a bit of a headache due to the rapidly changing weather we are experiencing. However, I managed to get through another day of my Wii workout. Today was yoga and aerobics. My body is a bit shaky after the workout and I am sweating more than you would like to know about. I am proud that I got through the workout even though my head was trying to lure me back into bed! Voice Update: Well, I pretty much said it all in the main part of my blog but . . . I am doing well. I did talk to Susan about the man I met who had a good voice for five years and has regressed. Susan told me not to worry because he regressed due to a botched Botox shot and she doesn't think I will regress as long as I continue to be vigilant (!) about my exercises. Even though my muscles ached all day yesterday making every movement excruciating*, I made it through the day! Work went well despite the awful woman recording on the United Healthcare automated help line. I don't understand how she can ask me to repeat something and then cut me off while I am repeating it! She isn't as nice as the Aetna man recording. He sounds like a cutie! I think I have a crush on him! * This is a HUGE exaggeration. My muscle did ache but it was just a tick above the annoying level. I am just being a wimp! Despite my muscles' protest, I got busy with the Wii again this morning. It was Yoga and strength training today. Not surprisingly, my push ups weren't as good as they were on Monday - probably due to my sore bicep muscles! My balance wasn't as good as usual either - probably because my calf muscles are competing to see who can be the "camp cramp champ!" Actually, after going to bed with an aspirin, I woke up MUCH better. Only my calves are still really protesting. This surprises me a bit since I walk pretty much everyday. They should be used to being abused! By the way - still no walking since the arctic air is heading this way. It was a bit warmer today - about 30 - but tomorrow and Friday are supposed to be lows of 15 or so with highs during the days of only the low 20s. Brrrr! Speaking of bed . . . it is blue blanket time! What? You don't know about blue blanket time? You don't do this at YOUR house? Actually, that doesn't surprise me too much! Blue Blanket Time only comes about in our household when the temperatures dip lower than normal during our winters. This "ritual" involves days of discussing if we need an additional blanket on the bed - the blue blanket. Then, after the decision to put the blue blanket on the bed there is the straining to remember just where we put the blue blanket after the last cold snap. This leads to a hunt through every closet in the house until the blue blanket is found and triumphantly carried back to the bedroom. Next, there is the debate over just how we should put the blanket on the bed. Over the comforter? Under the comforter? Do we tuck it in at the bottom? Leave it longer at the top? As always, we decide to put the blue blanket under the comforter (to minimize the white cat hair accumulation on the dark blue blanket) and to not tuck it in but to leave a fold at the bottom for extra warmth for our feet. Now we strip the comforter off the bed (after pushing Skor off the bed once or twice), spread the blue blanket over the sheet (again, after pushing Skor off the bed at least once), fold the bottom of the blanket up for the foot warming area, and then pulling the comforter over the bed (with Skor between the blanket and the comforter). A faint smile creeps onto Hubby's face as he anticipates a nice, toasty warm night of sleep. He is the one who is almost always cold at night. Me - I am the one who can sleep with only a sheet most of the time! We hurry to get ready for bed and then slide into our newly blue blanketed bed. We both sigh with contentment as we feel the foot warming layer doing its job. Yes, there isn't anything quite as satisfying as blue blanket time! Voice Update: Still doing pretty well. I must admit that I slacked on my exercises yesterday. I think my muscle aches distracted me from my needed work! I am doing some massage this morning to work out some soreness from my neck muscles. I will "hit" the inhalation exercises in just a moment (can't type and do them at the same time for some reason!). I do have a speech appointment today so we will see what Susan thinks about my voice! Now I have gotten the balance board back out, dusted it off, changed the batteries, and have gotten back to work! Today was my second day in a row (please hold the applause until I reach a good number like 10 or so!) to work out and I just want to tell you - if anyone reading this thought that the Wii Fit can't possibly give you a good workout . . . think again! Yesterday I did my "Monday routine" which starts with some Yoga poses and then moves on to some strength training exercises before finishing up with a couple balance games. Last night I could already tell that I had worked out. My body was complaining about the activity! Not my legs so much - they are used to walking every morning - but my arms and sides! Can you say - do I really need to lift my arms for anything today? This morning it was difficult to drag myself out of bed despite the hard working kitty (Skor) who was determined that I would. My body really, really just wanted an aspirin and more sleep. However, I got up, made Hubby his lunch (because he does so much for me! ), and then got to work. Tuesday's routine starts with more Yoga - stretching is important every day, right? - and then moves on to aerobic exercise (hula hooping really takes a lot out of you!) and ends with a couple balance games. Once I actually started working out, my muscles capitulated and got with the program. I am a bit aprehensive about what my muscles will feel like in a couple of hours. It might make work "interesting!" Two days in a row. Not too bad for a start. Let's see if I can stick to this when I start walking again. Now THAT would be dedication! Voice Update: In the morning my voice was excellent! I had no difficulties at all with any sounds. However, after working at packing at the office and talking to Linda for about three hours . . . my voice was a bit fractious when I got home! The word "two" was of particular difficulty for some reason. I did my massage and my inhalation voicing so we will see how things go today at work. I did get a new massager from work - someone gave it to Linda and she didn't use it so she gave it to me. The massager is a small thing which is powered through the USB port in a computer! The whole thing is a bit underpowered but it is nice for some quick muscle massage while working on the computer! After my last post several people had questions about what (in the world) Chrismons are so I did a little research to ensure that I could explain clearly. It was actually very interesting to me since I had never really taken the time to learn why these things were called Chrismons and what that word really meant. I found the following on Wikapedia so take it as it is meant . . .
A chrismon is one of number of Christian symbols intended to represent aspects of the Person, life or ministry of Jesus Christ and the life, ministry or history of the Christian Church through a single image, emblem or monogram. The term "chrismon" comes from the Latin phrase "Christi Monogramma", meaning "monogram of Christ". Chrismons can be found in all sizes, any sort of construction, and are used in numerous applications. Often, the Ρ is formed to look like a shepherd's crook and the Χ like a cross, symbolizing Jesus Christ as Good Shepherd of his flock, the Christian Church. Perhaps most commonly, chrismons are used to adorn liturgical devices and Christmas Trees during Advent and Christmas, where they are made from various materials ranging from needlepoint to woodwork and metalwork. They can also be found as decorations in and outside of Christian church buildings and homes, and even found on gravestones and personal stationary. Okay - Now that you know the basics. From my Internet search for Chrismons I found that these ornamental symbols can be made in many, many ways. There are cross-stitched versions, wood versions, metal versions, Styrofoam versions, cloth versions and more. The ones our church made were made of felt with wire in between the layers to provide structure. Various types of trim - sequins, beads, crystals - were used to decorate the Chrismons. As you can tell from my picture of the Chrismon tree, they make an impressive display while inspiring the viewer to remember the reason we celebrate Christmas. Voice Update: Doing fine. I really hit the inhale hard yesterday doing some inhale reading (of Poe) as well as some cyclical reading (where I alternate inhalation voicing with regular voicing). My neck and jaw are not nearly as tender as they were last week but I continue to rub those areas with the intention to keep them from becoming sore again. I have been doing massage but not nearly as much as I should. I do have a speech appointment this Wednesday so I will get "kicked" back into shape! I hope everyone had a very Happy New Year's Eve and New Year's Day! Me, I had a nice, quiet time at home with Hubby - just the way I like it. Look what Hubby and I saw when we were at Church . 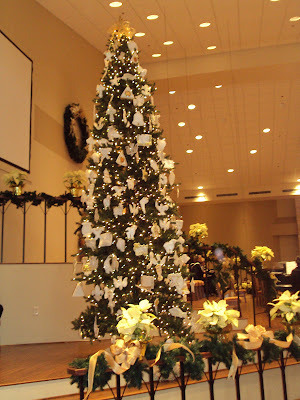 . .
A beautiful, TALL Christmas tree covered in Chrismons! The tree is so tall, in fact, that it actually blocks one of the two screens where they project words to hymns, etc. On closer examination . . . Hubby and I saw this lovely Chrismons! Yes, it is the Chrismons that I made. By hand! Yeah! I was just happy that they put it on the tree. Most of the other Chrismons were much fancier with pearls and crystals but mine was just sort of plain. Just like me! Let's see - what else is going on in my neck of the woods. . . I had a wonderfully relaxing lunch with my friends Donna and Caroline this week. They are always such fun to talk to. We at at Souper Salad - one of my favorite places - and then headed over to check out the nearby book stores. I actually purchased a book. Of course, I had a coupon! It is a rare occurrence when I purchase a book from a bookstore which isn't Half-Price Books and isn't on their clearance shelves! Wal Mart was the site of my weekly grocery shopping trip this week primarily because my local Kroger store doesn't carry much in the way of pork roasts and you HAVE to have pork on New Year's Day. With sauerkraut! You HAVE to! I know a lot of people, especially those down here in the south say it is black-eyed peas but I am staying true to the traditions I grew up with up north! Anyway - I DID buy another book at Wal Mart - a Christmas themed book which looked interesting. Of course, I have already finished reading it and I enjoyed it a lot. Hopefully, I will pass it on to someone else who likes to read so they can enjoy it as well. Speaking of books . . . it has been a while since I did a book post and the pile of books I need to "talk" about is growing a bit unwieldy. Maybe I will simply pick the best of the pile to share. Such dilemmas! Voice Update: Pretty good today even though I am not feeling too well. I have been working on getting rid of the sore spots on my neck and that is helping my voice - of course. I have also been trying to get in more inhalation voicing. The other day I only spoke in inhale around the house (I was talking to the cats and singing along with my ipod - all on the inhale). It seems to help me a lot. In news sort of related to my voice - I got a bit motivated this morning and have been doing some planning for my SD support group. Hopefully, everything will keep falling into place. Which reminds me . . . looking for a good place to donate money in 2010? Check out the National Spasmodic Dysphonia Association!